Niche Housekeeping Services hard at work. 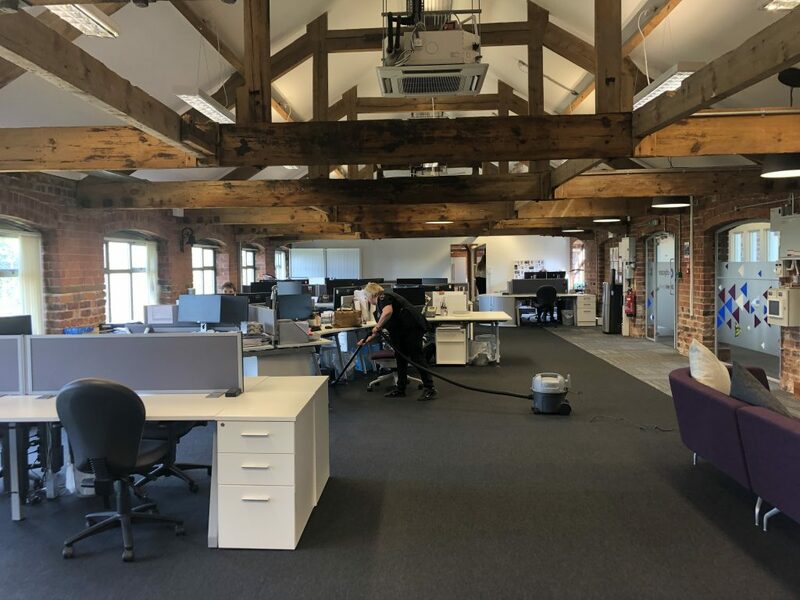 Helping businesses across Hull and the surrounding area to keep workplaces spotless, Niche Housekeeping Services believes that cleanliness is fundamental to maintaining high levels of productivity and employee wellbeing. It’s time for the office spring clean. Whilst regular cleaning makes your surroundings look more professional and welcoming, keeping everything spick and span can also have a positive impact on the way a company operates on a daily basis. For instance, according to the Health and Safety Executive there are currently 1.4 million workers suffering from work-related ill health, whilst the Office for National Statistics has found that 12.7% of all sickness absence days can be attributed to mental health conditions. Focusing on a workplace’s appearance and hygiene levels in equal measure, Annette’s team of use specially selected products for specific tasks and new cleaning equipment for every job: “Only this way can we guarantee that everything from kitchens and bathrooms, to floors, desks, skirting boards and windows are consistently cleaned down to a microscopic level,” she explains. Niche Housekeeping Services also offers advice that can help companies of all shapes and sizes to improve the overall atmosphere of their premises. Though simple and quick to achieve, you may be surprised how effective these tips are at improving productivity, morale and shared pride at your company. If the stationery cupboard is a minefield or the champagne glasses in the staff room are impossible to reach, this is where you should begin. Jobs like these are often neglected due to the space being hidden from view or the items in question only being required now and then, yet ticking them off your list is a great way to feel a sense of accomplishment. Unless your business only hires neat freaks, there will surely be a lot of superfluous items and unnecessary junk scattered around. From paperwork that’s no longer needed and can be shredded, to broken hardware that’s ready for a recycling centre, chances are you can free up plenty of space simply by having a good old tidy. If this is extended to cupboards, drawers and unseen areas, you can ensure that everything within your building serves a purpose. In the process, make sure to recycle as much as possible, plus unwanted items that are in good condition can be donated to a charity shop or community project. The average workplace will naturally gain additional furniture, storage units and other large items over time. This can lead to the layout of a room becoming illogical, which in turn can slow down productivity due to areas being difficult to access and clutter causing a hazard. By assessing what’s required and its ideal placement in relation to everything else, you can optimise the way staff move around and use their surroundings. The majority of workplace accidents are a result of situations that can be easily rectified. Trailing cables, electrical equipment too close to the edge of a surface, items dropped on the floor and boxes obstructing emergency routes are not only unsightly, they can also contravene health and safety regulations. By fixing the problems and training staff in best practices, your workplace will remain safe and manageable long-term. If every member of staff has a desk organiser, combined with communal filing cabinets, shelving units and other appropriate storage furniture, there’ll be no excuse for random items being scattered willy-nilly. This not only makes the place look nicer, but also results in everything becoming much more accessible, which can prevent scenarios that cause stress, anxiety and upset. The odd potted plant here and there will add welcome colour and life into any workplace; meanwhile, fresh air can do wonders for keeping employees focused and motivated. You could also look into other perks and activities that influence positive mental health, such as quick access to fresh water, free fruit for employees, a bike to work scheme, and regular fitness sessions that can range from lunchtime runs to after-work football matches. You can follow Niche Housekeeping Services on Facebook, Twitter and Instagram for regular tips on keeping your home and workplace attractive, organised and stress-free. Be the first to comment on "Top tips for spring cleaning the office that may deliver efficiency benefits too"